I won’t repeat everything that’s been said on Mix now, you should read this article and this IEBlog entry and get the IE platform preview. 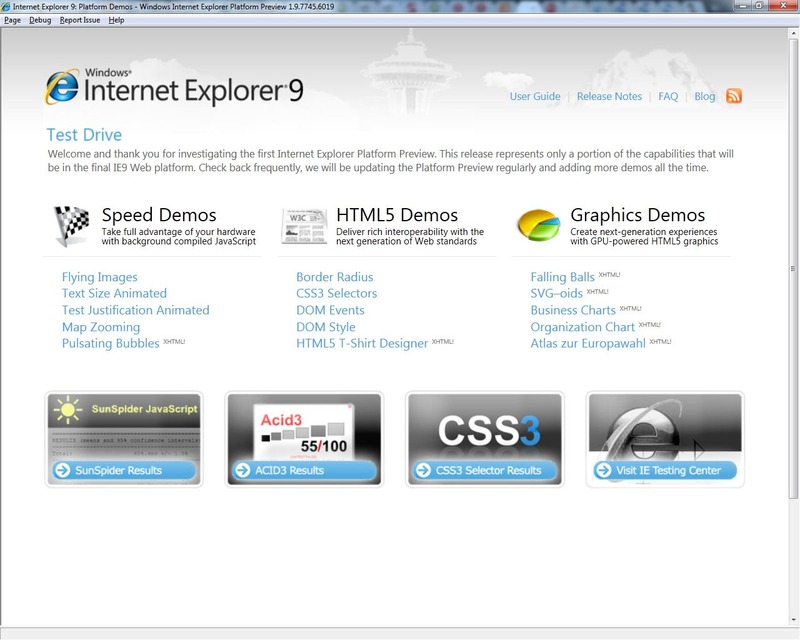 Don’t be afraid that IE9 will spoil your IE8 – IE9 preview doesn’t replace IE8 or anything, it’s got new jscript engine (called “Chakra”), new Trident layout engine version and wininet bundled in one package (31 megabytes installed size!) – first time when Microsoft does it this way – very impressive! JIT-powered js optimisation in jscript engine (Sunspider reports speed faster than Firefox 3.7 alpha2) – looks similar to Apple’s Nitro JIT. Unfortunately, IE9 is not available for Windows XP (and it won’t be), the main reason is the security model – basically, XP security model just doesn’t suit for IE9. Quite right, XP is nearly 10 years old! Another reason is that graphical core on Windows XP works in a different way, so IE9 hardware acceleration just cannot work there. Of course, IE9 follows the same logics IE8 has in terms of backwards compatibility – rules that I described here apply to IE9 – if X-UA-Compatible header/meta is set to Edge, IE9 new engine will run. Of course, it will render sites with correct doctype (but withouth X-UA-Compatible) in IE9 standards mode, and it will continue support for compatibility view lists feature. So old crappy sites designed for IE6 will still work in compatibility mode, and new sites will work in awesome IE9 in the standards mode without any problems. Read the abovementioned post for more details. canvas support – wasn’t announced, but I think this is a natural move when SVG is already done and done properly! But anyway, the whole feeling after watching IE9 keynote session is IT’S AWESOME! We’re entering the new era when Microsoft browser is faster than others, more secure (it’s been more secure than others since IE8b1) and provides better level of standards support.